Movistar Estudiantes Madrid (Liga Endesa) has announced the deal with 24-year old Congolese forward Junior Etou (203-109kg-94, college: Tulsa). He started the season at Sakarya Buyuksehir Basketbol in Turkish BSL league. Etou managed to play in three leagues this year (!!!). In 20 BSL games he averaged 11.5ppg, 7.7rpg, 1.6apg and 1.0spg. Etou also played 5 games in FIBA Europe Cup where he had 12.8ppg, 6.4rpg and 1.0apg. And finally he contributed to 2 games in Basketball Champions League where he recorded 10.0ppg, 3.5rpg and 2.0apg. Etou received NABC NCAA D1 All-District 25 2nd Team award in 2018 at his college time. Etou graduated from University of Tulsa in 2018 and it is his first season in pro basketball. We bring you last week's top performances from Congolese who are playing abroad and who all have had prior experience of national team duties at youth or senior level. #1. This week's number one is an international small forward Christian Eyenga (201-89, currently plays in Spain). He led Baloncesto Fuenlabrada to an overtime victory against the closely-ranked Blusens Monbus (11-16) 104-101 in the Spanish Liga Endesa last Sunday. Eyenga recorded 15 points and blocked 2 shots (made all of his five free throws). Montakit Fuenlabrada (10-17) is placed 14th in the Liga Endesa. Eyenga has relatively good stats this season: 10.4ppg, 3.4rpg, 1.3apg, 2FGP: 50.4%, 3FGP: 33.3% and FT: 71.1%. He is currently a member of the DR Congolese senior national team. #2. Second place goes to an international power forward Evariste Shonganya (204-92, currently plays in Sweden). Shonganya led KFUM Jamtland to a victory against the league leader Sodertalje Kings (29-7) 84-76 in the Swedish Basketligan on Friday night. He recorded 14 points, 5 rebounds, 3 assists and made 3 blocks in 26 minutes. KFUM Jamtland Basket (23-13) is placed fifth in the Basketligan. It was his team's third consecutive victory in a row. It's Shonganya's first season with the team. This year Shonganya has relatively solid stats: 13.1ppg, 8.4rpg, 2.6apg, 1.2bpg, 2FGP: 57.6%(174-302), 3FGP: 25.0% and FT: 54.4% in 33 games he played so far. He is in the roster of the DR Congolese senior national team. #3. The DR Congolese player who performed third best last week abroad was an international power forward Ruphin Kayembe (201-92, currently plays in France). He could not help ALM Evreux (10-17) in their last game on Friday. Despite Kayembe's good performance ALM Evreux was badly defeated 94-78 on the road by the leading Chorale de Roanne. He scored 12 points. Kayembe has reliable stats this season: 12.0ppg, 5.2rpg, 1.2apg, 2FGP: 59.0%(62-105) and FT: 60.5%. He has a dual citizenship: DR Congolese and Belgian. Kayembe is also a member of the DR Congolese senior national team. #4. Forward Omari Gudul (206-94, college: Angelo St., currently plays in France) contributed to an ADA Blois' victory against the 16th-ranked Aix-Maurienne (8-19) 67-61 in the French ProB (second division) in Friday night's game. He scored 9 points and grabbed 6 rebounds in 17 minutes. ADA Blois Basket 41 (14-12) is placed ninth in the ProB. Gudul's stats this year are: 11.3ppg and 5.8rpg in 26 games. He is also DR Congolese national team player. #5. International guard Mathieu Kamba (196-95, agency: Dynamics Global Management, college: Cent Arkansas, currently plays in Spain) was not able to help Araberri (7-25) in their last game on Sunday. Despite Kamba's very good performance the bottom-ranked Araberri was crushed 105-68 on the opponent's court by the much higher-ranked Magia_Huesca (#10). He was the top scorer with 17 points. There are only two games left until the end of the Regular Season. So now every game will be critical. Kamba's stats this season are: 12.8ppg, 3.6rpg, 1.6apg and 1.8spg. He is another player who holds two passports: Canadian and DR Congolese. Kamba plays currently for the DR Congolese national team. #6. Swingman Shekinah Munanga (201-97, currently plays in France) contributed to a 2-point Etoile Angers' victory against the second-ranked Charleville-Mezieres (11-4) 86-84 in the French NM1 (third division) on Friday night. Munanga scored 12 points, had 6 rebounds and dished 3 assists. It was the game of the round between two top 3 ranked teams in group Places 11-20. Etoile Angers Basket (11-3) is placed first. It was his team's fifth consecutive victory in a row. They will play only one more game in the Second Stage. And now that game is very crucial. This season Munanga averages: 5.6ppg and 4.2rpg. He is an international player who is currently on the senior DR Congolese National Team roster. #7. International point guard Carl Ona-Embo (185-89, currently plays in France) was not able to secure a victory for Caen (7-20) in their last game. Despite his very good performance Caen lost 70-77 at home to the second-ranked JA Vichy. Ona-Embo was the top scorer with 19 points. He also added 6 assists in 33 minutes. It was his first game for Caen this season. Worth to mention Ona-Embo played also at Eurobasket Summer League, which helped him get the job in pro basketball. Despite Ona-Embo played previously for the French U20 national team, he is currently in the DR Congolese national team roster. #1. Experienced Charles Kahudi (199-SF-86, currently plays in France) could not help ASVEL Lyon-Villeurbanne Basket (21-7) in their last game. Despite his very good performance the league leader ASVEL Lyon-Villeurbanne Basket was crushed 96-74 on the road by the lower-ranked (#7) JSF Nanterre. Kahudi was the top scorer with 20 points in 28 minutes. It was ASVEL Lyon-Villeurbanne Basket's first loss after five consecutive victories. It's Kahudi's fourth season with the team. This year he averages: 8.9ppg and 3.7rpg in 23 games he played so far. Kahudi has a dual citizenship: DR Congolese and French. #2. Wen Boss Mukubu (198-F-83, college: UAB, currently plays in Belgium) was the major contributor in a Limburg United's victory against the closely-ranked Belfius Mons-Hainaut (15-13) 85-78 in the Belgian Euromillions League in Saturday night's game. Mukubu recorded 14 points and grabbed 5 rebounds. Hubo Limburg United (12-16) is placed sixth in the Euromillions League. This season Mukubu averages: 6.5ppg, 3.4rpg and 1.4apg. He is another player who holds two passports: DR Congolese and Belgian. #3. 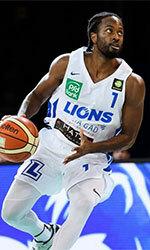 Guy Muya (193-PG-83, currently plays in Belgium) contributed to a Basic-Fit Brussels' victory against the league outsider Liege Basket (5-22) 82-77 in the Belgian Euromillions League last Sunday. Muya recorded 7 points in 16 minutes. Basic-Fit Brussels (18-10) is placed fourth in the Euromillions League. It was his team's third consecutive victory in a row. Muya has been at the team for four years. This season he averages: 5.2ppg, 2.4rpg and 1.4apg in 27 games. Muya has both DR Congolese and Belgian nationalities. #4. Yannick Bokolo (191-SG-85, currently plays in France) was not able to help Pau-Lacq-Orthez in their game against JL Bourg (16-12) in the French Jeep ELITE ProA. He cannot count Saturday's game as one of the best ones. Bokolo recorded only 2 points in 13 minutes. Pau-Lacq-Orthez lost 74-85 at home to the lower-ranked (#8) JL Bourg. Bokolo has been at the team for five years. This season he averages: 2.1ppg and 1.3apg in 25 games. Bokolo also holds two passports: DR Congolese and French. #5. Cedric Kuakumensah (204-F-93, college: Brown, currently plays in France) managed to help BC Souffelweyersheim to win against the tenth-ranked La Charite (2-12) 96-83 in the French NM1 (third division) in Saturday night's game. He scored only 2 points, had 5 rebounds and dished 5 assists. BC Souffelweyersheim (11-2) is placed first in Places 1-10 group. There are only four games left until the end of the Second Stage. So now every game will be critical. This season Kuakumensah averages: 9.5ppg, 7.1rpg and 2.1apg. He is a naturalized American. Strangely Kuakumensah has never played in DR Congo. #6. Kevin Zabo (188-G-95, agency: Mansfield and Associates, college: Kent St., currently plays in Spain) led Albacete to a 3-point victory against the fifth-ranked Cocinas.com 82-79 in the Spanish LEB Silver (third division) last Sunday. He recorded 15 points in a mere 17 minutes. Zabo averaged so far 12.6ppg, 1.9rpg and 1.6apg in 10 games. He holds both DR Congolese and Canadian passports. Despite Zabo's DR Congolese nationality, he previously played for the Canadian U17 national team and is probably not eligible to play for the DR Congolese team. #7. Panagiotis Mayindombe (191-G-88, currently plays in United Kingdom) helped Bristol Acadamy Flyers win their game against the league outsider Worcester Wolves 92-88 in the British BBL in Friday night's game. Mayindombe scored 5 points in 12 minutes. This year Mayindombe's overall stats are: 2.6ppg, 1.8rpg and 1.2apg in 30 games. He has dual citizenship: DR Congolese and Greek. #8. Nicola Akele (203-F-95, college: URI, currently plays in Italy) was not able to secure a victory for Roseto Sharks in their game against Consultinvest BO in the Italian Serie A2 (second division). Akele scored 6 points. His team was defeated 92-81. Akele averaged so far 13.3ppg, 6.9rpg, 1.5apg and 1.3spg. He holds both DR Congolese and Italian passports. Despite Akele's DR Congolese nationality, he previously played for the Italian U20 national team and probably cannot be called to the DR Congolese team. #9. Djo M'Putu (196-C-98, currently plays in Switzerland) helped Boncourt win their game against the fourth-ranked Starwings 95-80 in the Swiss SBL in Wednesday night's game. M'Putu recorded only 2 points. This season M'Putu averages just 1.9ppg. He has dual citizenship: DR Congolese and Swiss. #10. Joel Ndondo (203-C-93, college: Wayne St., MI, currently plays in NBLCanada) couldn't help the Moncton Magic in their game against the Halifax Hurricanes in the NBL Canada. Ndondo recorded only 4 points in 6 minutes on the court. His team lost 87-102. This year Ndondo averages just 1.9ppg in 16 games. He holds both DR Congolese and Canadian passports. Caen Basket Calvados (ProB) added to their roster 29-year old naturalized Congolese point guard Carl Ona-Embo (185-80kg-89). He started the season at PS Karlsruhe Lions in German ProA. In 21 games he had 8.0ppg, 1.9rpg and 2.3apg this season. The most of last season Ona-Embo spent at Hermine Nantes Atlantique where in 31 ProB games he recorded 5.3ppg, 1.7rpg and 1.7apg. He also spent pre-season at JA Vichy earlier that year. Three years ago Ona-Embo was drafted by Salt Lake City Stars (D-League) in third round (49th overall). He was a member of French U20 National Team back in 2009. Ona-Embo is quite experienced player. He has played also professionally in Italy (Edilnol Bl), Spain (Rosalia), France (Olympique Antibes, Cholet Basket, CFBB, JL Bourg and Poitiers) and NBA G League (Santa Cruz Warriors). Ona-Embo is a former Eurobasket Summer League player, which is considered top summer league for players who want to play basketball overseas. #1. This week's number one is former international guard Emmanuel Mudiay (196-96, currently plays in NBA). He could not help the New York Knicks (16-64) in their last game. Despite Mudiay's good performance the New York Knicks (16-64) lost 100-114 on the road to the Orlando Magic. He had a double-double by scoring 13 points and making 10 passes. Mudiay also added 7 rebounds in 40 minutes on the court. There are only two games left until the end of the NBA Regular Season. So now every game will be critical. It's Mudiay's first season with the team. He has individually a very good year with high stats. Mudiay averages: 14.8ppg, 3.3rpg, 3.9apg, 2FGP: 49.2%, 3FGP: 33.0% and FT: 77.4% in 59 games he played so far. He played for the DR Congolese senior national team two years ago. #2. Second place goes to an international power forward Ruphin Kayembe (201-92, currently plays in France). He was not able to help ALM Evreux (10-15) in their last game. Despite Kayembe's very good performance ALM Evreux lost 83-91 in Blois to the higher-ranked (#8) ADA Blois. He had a double-double by scoring 20 points and getting 10 rebounds in 26 minutes. Kayembe has relatively good stats this year: 12.0ppg, 5.6rpg, 1.3apg, 2FGP: 58.9%(53-90) and FT: 55.6% in 11 games. He has a dual citizenship: DR Congolese and Belgian. Kayembe is in the roster of the DR Congolese senior national team. #3. The DR Congolese player who performed third best last week abroad was an international small forward Christian Eyenga (201-89, currently plays in Spain). He was not able to secure a victory for Baloncesto Fuenlabrada (9-16) in their last game on Sunday. Despite Eyenga's good performance Baloncesto Fuenlabrada was crushed 99-76 on the opponent's court by the higher-ranked Burgos (#11). He scored 11 points, grabbed 5 rebounds and dished 3 assists. Eyenga's overall stats this season are: 10.0ppg, 3.4rpg, 1.3apg, 2FGP: 48.8%, 3FGP: 33.9% and FT: 70.8%. He is also a member of the DR Congolese senior national team. #4. Forward Omari Gudul (206-94, college: Angelo St., currently plays in France) faced previously mentioned Ruphin Kayembe in the French ProB last game. Gudul led ADA Blois to a victory against the 12th-ranked ALM Evreux (10-15) 91-83. He recorded 15 points and grabbed 8 rebounds in 27 minutes; quite an impressive performance considering it's only Gudul's third season in pro basketball. This year Gudul has relatively solid stats: 11.8ppg and 5.9rpg in 24 games. He is also DR Congolese national team player. #5. International power forward Evariste Shonganya (204-92, currently plays in Sweden) contributed to a KFUM Jamtland's victory against the closely-ranked BC Lulea (24-12) 86-75 in the Swedish Basketligan last Tuesday. Shonganya recorded 9 points and grabbed 6 rebounds. KFUM Jamtland Basket (23-13) is placed fifth in the Basketligan. It was his team's third consecutive victory in a row. Shonganya has reliable stats this season: 13.5ppg, 8.9rpg, 2.7apg and 1.2bpg. He plays currently for the DR Congolese national team. #6. Guard Mathieu Kamba (196-95, agency: Dynamics Global Management, college: Cent Arkansas, currently plays in Spain) couldn't help Araberri (7-23) in their last game. Despite Kamba's good performance the bottom-ranked Araberri was badly defeated 68-52 on the opponent's court by the much higher-ranked (#11) Lleida_Basquet. He was the second best scorer with 11 points. Kamba also added 4 rebounds in 34 minutes. It was Araberri's eighth consecutive loss in a row. There are only four games left until the end of the Regular Season. So now every game is very crucial. Kamba's stats this year are: 12.4ppg, 3.7rpg, 1.5apg and 1.9spg in 30 games. He is an international player who is currently on the senior DR Congolese National Team roster. #7. International center Gullit Mukendi (203-96, currently plays in Spain) couldn't help Azuqueca (13-16) in their last game on Saturday. Despite Mukendi's very good performance the tenth-placed Azuqueca (13-16) was defeated 92-77 at home by the higher-ranked Estela (#7) in the East group. He was the second best scorer with 15 points. Mukendi also added 3 blocks. Mukendi's overall stats this season are: 4.7ppg and 2.5rpg. He is also DR Congolese national team player. #8. Swingman Shekinah Munanga (201-97, currently plays in France) helped Etoile Angers win their game against the ninth-ranked Kaysersberg (4-8) crushing them 85-55 in the French NM1 (third division) last Friday. Munanga recorded 10 points and grabbed 9 rebounds in 24 minutes. Etoile Angers Basket (9-3) is placed second in Places 11-20 group. It was his team's third consecutive victory in a row. There are only three games left until the end of the Second Stage. This year Munanga's overall stats are: 5.1ppg and 3.9rpg in 27 games. He plays currently for the DR Congolese national team. #9. International point guard Carl Ona-Embo (185-89, currently plays in Germany) couldn't help Lions (16-14) in their last game on Saturday. Despite his good performance Lions was defeated 89-77 on the opponent's court by the leading Chemnitz. Ona-Embo was the top scorer with 12 points. Ona-Embo's total stats this season are: 8.4ppg, 2.1rpg and 2.4apg. Ona-Embo attended previously one of camps at Eurobasket Summer League on his way to pro basketball. Despite he played previously for the French U20 national team, Ona-Embo is currently in the DR Congolese national team roster. #1. Experienced Charles Kahudi (199-SF-86, currently plays in France) contributed to an easy victory against the 16th-ranked Olympique Antibes (8-15) 87-72 in the French Jeep ELITE ProA last Friday. Kahudi recorded 9 points and grabbed 5 rebounds (made all of his six free throws). ASVEL Lyon-Villeurbanne Basket (19-6) is placed first in the Jeep ELITE ProA. It was his team's third consecutive victory in a row. Kahudi is one of the most experienced players in a team as it's his fourth year in ASVEL Lyon-Villeurbanne Basket's roster. His overall stats this season are: 9.0ppg and 3.9rpg. Kahudi has a dual citizenship: DR Congolese and French. #2. Bismack Biyombo (206-C-92, currently plays in NBA) contributed to a Charlotte Hornets' victory against the New Orleans Pelicans (33-48) 115-109 in the NBA last Wednesday. Biyombo scored 7 points and grabbed 9 rebounds in 22 minutes. The Charlotte Hornets have 38-42 record this season. It was his team's third consecutive victory in a row. There are only two games left until the end of the NBA Regular Season. So now every game will be critical. This year Biyombo's overall stats are: 4.3ppg and 4.6rpg in 52 games he played so far. #3. Cedric Kuakumensah (204-F-93, college: Brown, currently plays in France) could not help Souffelweyersheim (9-2) in their last game on Friday. Despite his good performance the first-placed Souffelweyersheim (9-2) was defeated 75-63 on the road by the lower-ranked STB Le Havre (#5) in the Places 1-10 group. Kuakumensah recorded a double-double by scoring 10 points and getting 12 rebounds (made all of his five free throws). Kuakumensah's overall stats this season are: 10.0ppg, 7.1rpg and 1.9apg. He is a naturalized American. Strangely Kuakumensah has never played in DR Congo. #4. Bambale Osby (203-C-86, college: Maryland, currently plays in Kosovo) was not able to help one of league's weakest teams Xhebrailat in their game against Prishtina (25-0) in the Kosovan Superliga, despite his very good performance on Sunday night. He had a double-double by scoring 17 points and getting 11 rebounds. Osby also added 3 assists in 30 minutes. But Xhebrailat lost 77-90 on the opponent's court to the leading Prishtina. It was Xhebrailat's first loss after six consecutive victories. There are only two games left until the end of the Regular Season. So now every game is very crucial. Osby's stats this year are: 12.2ppg, 10.6rpg and 1.6apg in five games. He is a naturalized American. Worth to mention Osby played also at Eurobasket Summer League, which helped him get the job in pro basketball. Strangely Osby has never played in DR Congo. #5. Guy Muya (193-PG-83, currently plays in Belgium) helped Basic-Fit Brussels win their game against the eighth-ranked Okapi Aalstar (9-15) crushing them 102-72 in the Belgian Euromillions League in Sunday night's game. He scored 7 points. Basic-Fit Brussels (15-9) is placed fourth in the Euromillions League. Muya has been at the team for four years. Muya's overall stats this season are: 4.8ppg, 2.4rpg and 1.2apg. He is another player who holds two passports: DR Congolese and Belgian. #6. Panagiotis Mayindombe (191-G-88, currently plays in United Kingdom) was not able to secure a victory for Bristol Acadamy Flyers in their game against Glasgow Rocks in the British BBL, despite his good performance last Sunday. Mayindombe recorded 10 points and added 5 assists in 31 minutes. But his team was edged 113-111. This year his overall stats are: 2.3ppg, 1.8rpg and 1.2apg in 26 games. Mayindombe has both DR Congolese and Greek nationalities. #7. Nicola Akele (203-F-95, college: URI, currently plays in Italy) led Roseto Sharks to an easy victory against the fourth-ranked Tezenis VER crushing them 106-85 in the Italian Serie A2 (second division) on Sunday night. He recorded 11 points and grabbed 7 rebounds. Akele averaged so far 13.5ppg, 7.1rpg, 1.5apg and 1.3spg. He also holds two passports: DR Congolese and Italian. Despite Akele's DR Congolese nationality, he previously played for the Italian U20 national team and is probably not eligible to play for the DR Congolese team. #8. Junior Etou (203-F-94, college: Tulsa, currently plays in Spain) couldn't help Movil Estudiantes in their game against Gipuzkoa in the Spanish Liga Endesa. Etou cannot count Saturday's game as one of the best ones. He scored only 2 points in 6 minutes on the court. It was his first game for Movil Estudiantes this season. His team was edged 93-92. #9. Brice Massamba (208-F/C-88, college: UNLV, currently plays in Sweden) couldn't help BC Lulea in their game against KFUM Jamtland in the Swedish Basketligan. Massamba scored only 4 points. His team was defeated 103-90. Massamba's overall stats this season are: 3.2ppg and 1.7rpg. He holds both DR Congolese and Swedish passports. #10. Wen Boss Mukubu (198-F-83, college: UAB, currently plays in Belgium) managed to help Hubo Limburg United to win against the closely-ranked Kangoeroes crushing them 123-84 in the Belgian Euromillions League on Friday night. Mukubu scored only 3 points. Mukubu's total stats this season are: 5.9ppg, 3.4rpg and 1.5apg. He has DR Congolese and Belgian nationalities.